The first known published description of polyps arising from the maxillary antrum was in 1961, by the Dutch anatomist Fredyk Ruysch , in 1753 Palfyn described a two-sac polyp from the maxillary sinus , then in 1891, Zuckerland described a case of a solitary polyp arising from the maxillary sinus . In 1906, Professor Gustav Killian was the first who used the term antrochoanal polyp (ACP), describing it as a unilateral, solitary, pear shaped mass with a cystic stalk, differing from the regular polyps in the formation of a constricted sac, half in the maxillary antrum and the other half in the nose and nasopharynx , this definition is still used, and given ACP the eponym of Killian Polyp. Bilateral nasal polyposis is a clinical condition found in 1-4% of the Caucasian population . The ACP represents 4-6% of all nasal polyps [6,7], increasing up to 35% in the children population [8,9]. There is no clear gender difference in the pediatric age, occurs most commonly in children and young adults . In adults a male preponderance has been reported . There's still no confirmed theory about the physiopathology of the ACP, although it's accepted that it could arise from an antral cyst, a common benign tumor of the maxillary antrum present in 8-10% of the population , it has been suggested that they form by acinar mucous gland obstruction as a result from chronic phlogosis . The antral cyst formation is not enough to make an ACP, in 2009 Frosini, et al. made the hypothesis that chronic inflammatory factors, allergic or infectious, cause the development of an antral cyst closing the accessory maxillary ostium and the natural maxillary ostium partially, causing a valve-like feature, allowing the entrance of air to the maxillary sinus, creating a pressure drop perpendicular to the wall of the structure, blocking the ostium, this will contribute to the increment of the pressure forcing the cyst to herniate outside the accessory ostium, allowing the ACP formation . Another suggested mechanism for the formation of the antral cyst is that lymphatic obstruction, primary or secondary to chronic sinusitis, play a role in the formation of ACP [15,16]. It has been proposed a relation between Human Papilloma Virus (HPV) and Sinu Nasal Polyps (SNP), a german study of 257 tissue specimens (166 NP, 39 ACP and 52 control nasal turbinates) found HPV-DNA presence detected in 15.1% NP, 53.8% ACP and 5.8% of the control group, although with a statistical difference, the presence in ACP was limited to the epithelium, with low transcription proteins, the authors suggest there's an association but not as a causative factor for their development . Also, the expression of basic fibroblast growth factor and transforming growth factor-β is significantly higher in ACP than in tissue removed from patients with chronic rhinosinusitis , also levels of mucin gene expression, including MUC5AC, MUC5B and MUC8, demonstrates higher expression than chronic rhinosinusitis . Nasal deviation and higher maxillary sinus volumes have been associated with ACP, with no cause-effect relation . ACP lacks minor mucoserous glands and a well-developed eosinophilic inflammatory infiltrate, the surface epithelium goblet cells are less frequent than in a SNP, also the basement membrane is inconspicuous in most cases of ACP. Surface squamous metaplasia is observed in the ACP but not as often in a SNP . When extended to the nasopharynx, chronic inflammation is identified in a much greater degree . It is not uncommon that an ACP to undergo a cystic degeneration of the stroma, with a loosely reticular pattern or "pseudoangiomatous" growth as a result of either a chronic or subacute vascular compromise, these kinds of polyps are often described as its own clinical entity . ACP has a clinical diagnosis with a histopathologic confirmation, the classic ACP patient has unilateral nasal obstruction and nasal discharge, with a smooth polypoid mass originating in the middle meatus as it extends into the choana, nasopharynx and eventually to the oral cavity (Figure 1). There are some cases reported as a red hyper vascularized mass , bilateral ACP, although very rare, have been reported [25,26]. Also, can be presented with adult respiratory distress , dysphagia , and obstructive sleep apnea [29,30]. The imaging helps to excludes other diagnosis and the surgical plan for the ACP removal. The Computerized Tomography (CT) scan findings are a homogenously opacified, non-enhancing, hypo attenuating mass lesion in the maxillary sinus extending through a widened ostium, with a variable extension to the choana and nasopharynx, with no evidence of bone destruction (Figure 2) . There are no pathognomonic signs in the Magnetic Resonance imaging (MRI) but often shows as T1 hypointense and hyperintense in T2 with a peripheral enhancement in the cystic part when intravenous contrast is administered . The differential diagnosis for an ACP must include the Juvenile nasopharyngeal angiofibroma, an uncommon vascular tumor, almost exclusively found in young male patients (10-25 years) that starts with unilateral nasal obstruction and epistaxis. Imaging studies shows a highly enhanced mass with tissue destruction and bone remodeling . Another tumor that must be excluded is the Rhabdomyosarcoma, this malignant tumor has a bimodal distribution among 2-4 years and 12-16 years, when the nasopharynx is affected its signs and symptoms can be unilateral nasal obstruction with or without nasal discharge, at MRI it shows as an isointense T1 and iso- to hypointense signal on T2 with variable contrast enhancement. Other common differential diagnosis are the variations of the ACP, the choanal polyps arising from the ethmoid, or sphenoid sinus [34,35] and the common SNP. Although not common in the pediatric age other diagnosis that should be though are the Inverted Papilloma (IP), a benign tumor of the sinunasal cavities that can arise from the maxillary sinus, most commonly diagnosed in the fifth and sixth decade of life , IP can be found as a reddish-gray lobulated tumor, more firm and friable than an inflammatory polyp , IP may be associated to bone lysis by CT scan, in MRI is hypointense in T1, with homogeneous enhancement and a cerebriform aspect in T2 . Other rare pathologies the olfactory neuroblastoma, meningo- encefalocele, lymphoma or hemangioma . The excision of the polyp by functional endoscopic sinus surgery (FESS) with the concomitant treatment of the obstructed sinus complex, a safe procedure with relatively minor complications, like synechiae or epistaxis, is the cornerstone for the resolution of ACP in all ages . The external approaches as the Caldwell- Luc procedure (CWL), Mini Caldwell-Luc or transcanine sinuscopy could also be used for the definitive treatment, however currently are used if the origin of the ACP cannot be found or in revision surgery in a combined approach. In the pediatric age group, the combined approach recurrences were 0%, for FESS alone 17.7% with no significance difference for CWL recurrence of 9.1% . The suggested follow up for patients with ACP is 2 years to detect 95% of recurrence. Routine office nasal endoscopy is suggested, as in any FESS, to prevent and treat synechiae, to minimize complications. Recurrences have been reported from 6 months to 3 years after surgery, with reports of a higher recurrence in the pediatric age group compared to the adult group . These differences could be explained by the difficulty to find the ACP origin, FESS without angled endoscopes and instruments, and the narrow nasal anatomy of the pediatric group. The ACP is a benign tumor of the maxillary sinus that prolapse to the nasal cavity in a variable extent, almost always unilateral, more common in children, without gender difference in this age group, with a male predisposition in the adult age group. Although highly researched the exact physiopathology of the ACP is still unknown, so still there is no way of prevention. The image studies help for surgery planning and differential diagnosis, but still the standard diagnosis is clinical. The only treatment is surgery, including the total removal of the polyp, treating the associated obstructed sinus complex, preferably by functional endoscopic sinus surgery. The patient follow up should be of at least 2 years, there is no standard in how the patient should be followed. There isn't any funding source. Ruysch F (1691) Observation um anatomica chirurgicaram antur- ca. Palfyn J (1753) Anatomie chirurgicale. Paris. Zuckerkandl E (1892) Normale und pathologische Anatomie der Nasenholme. Vienna. Killian G (1906) The origin of choanal polypi. Lancet 2: 81-82. Montague ML, McGarry GW (2004) Familial antrochoanal polyposis - A case report. Eur Arch Otorhinolaryngology 261: 507-508. Towbin R, Dunbar JS, Bove K (1979) Antochoanal polyps. AJR Am J Roentgenol 132: 27-31. Woolley Audie L, Clary Randall A, Lusk Rodney P (1996) Antrochoanal polyps in children. Am J Otolaryngol 17: 368-373. Schramm VL Jr, Efferon MZ (1980) Nasal polyps in children. Laryngoscope 90: 1488-1495. Maldonado M, MartÍnez A, Alobid I, Mullol J (2004) The antrochoanal polyp. Rhinology 42: 178-182. Orvidas LJ, Beatty CW, Weaver AL (2001) Antrochoanal polyps in children. Am J Rhinol 15: 321-325. Settipane GA, Chafee FII (1977) Nasal polyps in asthma and rhinitis. A review of 6037 patients. J Allergy Clin Immunol 59: 17-21. Berg O, Carenfelt C, Silfversward C, Sobin A (1988) Origin of the choanal polyp. Arch Otolaryngol Head Neck Surg 114: 1270-1271. Chen JK, Schloss MD, Azouz ME (1989) Antrochoanal polyps: 10- year retrospective study in the pediatric population with a review of the literature. J Otolaryngol 18: 168-172. Frosini P, Picarella G, De Campora (2009) Antrochoanal polyp: Analysis of 200 cases. Acta Otorhinolaryngol Ital 29: 21-26. Mostafa HS, Fawzy TO, Jabri WR, Ayad E (2014) Lymphatic obstruction: A novel etiologic factor in the formation of antrochoanal polyps. Ann Otol Rhinol Laryngol 123: 381-386. Piquet JJ, Chevalier D, Leger GP, Rouquette I, Leconte-Houcke M (1992) Endonasal microsurgery of antro-choanal polyps. Acta Otorhinolaryngol Belg 46: 267-271. Knör M, Tziridis K, Agaimy A, Zenk J, Wendler O (2015) Human Papillomavirus (HPV) prevalence in nasal and antrochoanal polyps and association with clinical data. PLoS One 10: e0141722. Mahfouz ME, Elsheikh MN, Ghoname NF (2006) Molecular profile of the antrochoanal polyp: Up-regulation of basic fibroblast growth factor and transforming growth factor beta in maxillary sinus mucosa. Am J Rhinol20: 466-470. Balikci HH, Ozkul MH, Uvacin O, Yasar H, Karakas M, et al. (2013) Antrochoanal polyposis: Analysis of 34 cases. Eur Arch Otorhinolaryngol 270: 1651-1654. Aydın S, Taskin U, Orhan I, Altas B, Oktay MF, et al. (2015) The analysis of the maxillary sinus volumes and the nasal septal deviation in patients with antrochoanal polyps. Eur Arch Otorhinolaryngology 272: 3347-3352. Ozcan C, Zeren H, Talas DU, Küçükoğlu M, Görür K (2005) Antrochoanal polyp: A transmission electron and light microscopic study. Eur Arch Otorhinolaryngol 262: 55-60. Chung SK, Chang BC, Dhong HJ (2002) Surgical, radiologic, and his- tologic findings of the antrochoanal polyp. Am J Rhinol 16: 71-76. Skladzien J, Litwin JA, Nowogrodzka-Zagorska M, Wierzchowski W (2001) Morphological and clinical characteristics of antrochoanal polyps: Comparison with chronic inflammation-associated polyps of the maxillary sinus. Auris Nasus Larynx 28: 137-141. Lee DH, Yoon TM, Lee JK, Lim SC (2016) Difference of antrochoanal polyp between children and adults. Int J Pediatr Otorhinolaryngol 84: 143-146. Sabino HAC, Faria FM, Tamashiro E, Lima WTA, Valera FCP (2014) Bilateral antrochoanal polyp: Case report. Brazilian Journal of Otorhinolaryngology 80: 182-183. Yilmaz YF, Titiz A, Özcan M, Tezer MS, Ozlugedik S, et al. (2007) Bilateral antrochoanal polyps in an adult: A case report. B-ENT 3: 97-99. Whittle TT, Benzie S, Graham D (2017) Prolapsed antrochoanal polyp: An unusual cause of acute adult respiratory distress. BMJ Case Rep.
Swischuk LE, Hendrick EP (2000) Antrochoanal polyp originating from sphenoid sinus causing acute dysphagia. 358-360. Veerappan I, Ramar R, Navaneethan N, Dharmapuri Yaadhavakrishnan RP (2013) Antrochoanal polyp presenting as obstructive sleep apnea. Indian J Pediatr 80: 959-961. Weder S, Landis BN, Banz Y, Caversaccio M, Dubach P (2011) Paediatric traffic accident and obstructive sleep apnoea by antrochoanal polyps: Case report and literature review. Int J Pediatr Otorhinolaryngol 75: 1359-1363. Pruna X, Iban˜ez JM, Serres X, Garriga V, Barber I, et al. (2000) Antrochoanal polyps in children: CT findings and differential diagnosis. Eur Radiol 10: 849-851. Yaman H, Yilmaz S, Karali E, Guclu E, Ozturk O (2010) Evaluation and management of antrochoanal polyps. Clin Exp Otorhinolaryngol 3: 110-114. Boghani Z, Husain Q, Kanumuri VV, Khan MN, Sangvhi S, et al. (2013) Juvenile nasopharyngeal angiofibroma: A systematic review and comparison of endoscopic, endoscopic-assisted, and open resection in 1047 cases. Laryngoscope 123: 859-869. Íleri F, Köybaşioǧlu A, Uslu S (1998) Clinical presentation of a sphenochoanal polyp. Eur Arch Otorhinolaryngology 255: 138-139. İla K, Topdağ M, Öztürk M, İşeri M, Aydın Ö, et al. (2015) Retrospective analysis of surgical treatment of choanal polyps. Kulak Burun Bogaz Ihtis Derg 25: 144-151. Bugter O, Monserez DA, Van Zijl FVWJ, Baatenburg De Jong RJ, Hardillo JA (2017) Surgical management of inverted papilloma; A single-center analysis of 247 patients with long follow-up. J Otolaryngol Head Neck Surg 46: 67. Barnes L, Eveson JW, Reichart P, Sidransky D (2005) World Health Organization Classification of Tumours. Pathology and genetics of head and neck tumours. Lyon: IARC Press. Lisan Q, Laccourreye O, Bonfils P (2016) Sinonasal inverted papilloma: From diagnosis to treatment. Eur Ann Otorhinolaryngol Head Neck Dis 133: 337-341. Grainger AJ, Zammit-Maempel I (2001) Antrochoanal polyps in children. Eur Radiol 11: 347. Galluzzi F, Pignataro L, Maddalone M, Garavello W (2018) Recurrences of surgery for antrochoanal polyps in children: A systematic review. Int J Pediatr Otorhinolaryngol 106: 26-30. Chaiyasate S, Roongrotwattanasiri K, Patumanond J, Fooanant S (2015) Antrochoanal polyps: How long should follow-up be after surgery? 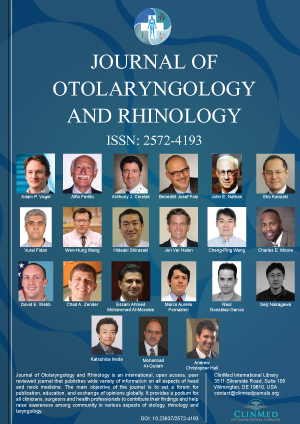 International Journal of Otolaryngology 2015: 1-5.